There are a couple of classic shows that never got a fair shake in the UK. You could say that about Rumiko Takahashi’s entire catalogue, but one of the shows that I’m thinking of here is Inuyasha, which had an abortive attempt at a release from Fabulous Films, the first thirteen episodes and no more. It’s about a girl who forms an unlikely and unwelcome partnership with a demon who had been sealed away for several years before she inadvertently released him, by pulling out the arrow that her ancestor had shot him with. 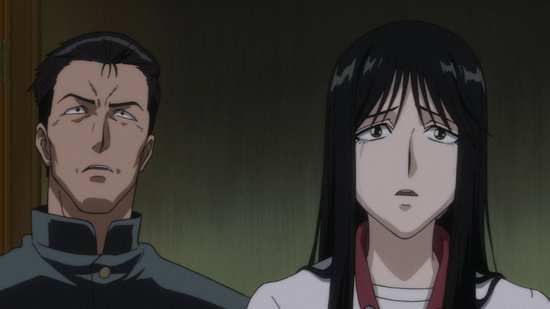 The second show is Ghost Sweeper Mikami, a wacky supernatural anime Ghostbusters, a series which never saw a release in the UK, but whose feature film spin-off was released here by Manga Entertainment. It was a whole lot of fun, and I would have loved to have seen more, but it too fell afoul of the reluctance to release long running shows in the UK. 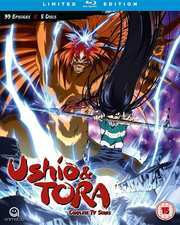 Which brings us to Ushio & Tora, a wacky supernatural comedy where the protagonist forms an unlikely and unwelcome partnership with a demon by pulling out the spear that has held him prisoner for 500 years. With Ushio & Tora based on a 1990 manga (it received an OVA series back in 1991), this 2015 full series adaptation should have the right vintage of wacky comedy too. Ushio Aotsuki seems your typical schoolboy, but being the son of a temple priest has its downsides, not least the regular lectures on Yokai demons, and his ancestor’s part in sealing one away. It’s the kind of thing that goes in one ear and out the other during a hasty pre-school breakfast. 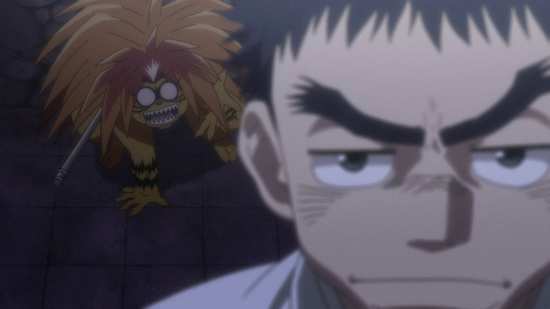 Ushio really should have paid more attention, for when his father takes a week off for a vacation, Ushio finds a trapdoor in a storage building leading to a cellar, where he finds a tiger-like yokai pinned to the wall with a large spear. Of course he’s not going to fall for the beast’s combination of threats and bargains; Tora’s been sealed away for 500 years and he’d love to eat this impudent human fool to satisfy his hunger. But by opening the trapdoor, Ushio’s attracted all manner of yokai to the vicinity, and when some of them attack his friends, Tora offers to help in exchange for being freed. 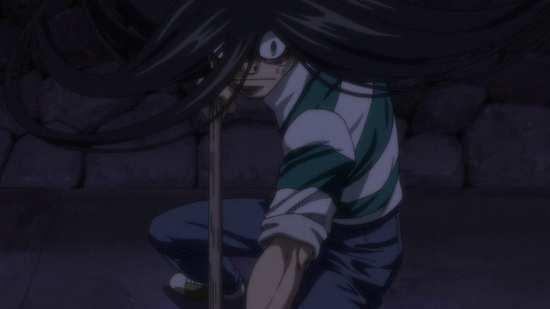 What’s unexpected is that by taking the spear, Ushio gains a few beast slaying powers himself. Now that Tora’s free, he really wants to taste Ushio’s flesh, but as long as Ushio has the spear, Tora can’t get close. And with all these yokai now drawn to them, the last thing that Tora wants is for something else to eat his prey before he can. This is going to the start of an odd friendship. 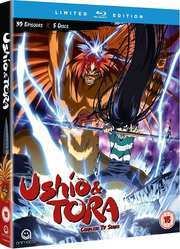 All 39 episodes of the recent Ushio & Tora series are presented across 5 Blu-rays, 26 episodes of the first series, and 13 episodes of the second. Ushio and Tora gets a 1.78:1 widescreen 1080p transfer. The image is clear and sharp, and there is no problem with compression, aliasing or even noticeable banding. It’s a fine transfer of an anime show to Blu-ray. Ushio and Tora is a curious hybrid, a recent anime adapted from a rather vintage manga, and that tells in the character designs, a lot quirkier and more expressive than the modern anime aesthetic, the animation accomplished with bold lines and bright colours, but with the digital finesse and high production values that modern animation techniques allow for. It looks really quite good, and gets you wondering what shows like Yu Yu Hakusho would look like if made today. You have the choice between DTS-HD MA 2.0 Stereo English and Japanese, with locked subtitles and signs. The stereo does a decent enough job of conveying the show’s action sequences, and making the most of the music. While I sampled the English dub, I was happy with the original language track, with some spirited performances for the characters, especially the title duo. The subtitles are timed accurately and are free of typos, although you might want to keep a finger close to the pause button for when the translation notes pop up on screen. The discs present their contents with static menus, and each episode is followed by a translated credit reel. All of extras are on disc 5, with three textless openings, three textless closings, 5:17 worth of Japanese Promos for the show, and Sentai trailers for Is It Wrong to Pick Up Girls in a Dungeon?, Utawarerumono: The False Faces, GATE, and AJIN: Demi-Human. There’s something to be said for cutting to the heart of the matter. 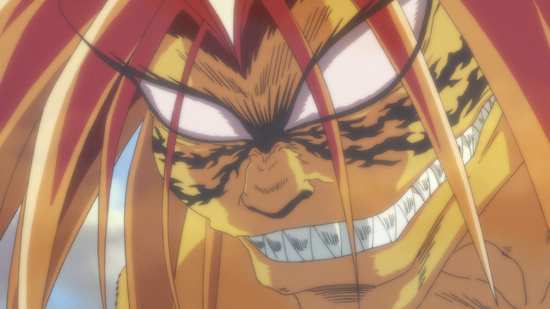 Ushio & Tora is one of those shonen action shows, a lot like Naruto, Bleach and One Piece, although thematically it has a lot more in common with the aforementioned Yu Yu Hakusho, with its tales of monsters and demons. With an ongoing manga series, the anime adaptation can be just as lengthy, if not more so with the advent of filler and recaps, and the need to stretch things out to vamp for time. Ushio & Tora on the other hand was commissioned almost twenty years after the manga series had concluded. That means that not only can they create a faithful adaptation of the manga, they can also, if they choose give it a proper televisual/cinematic adaptation, reworking the story so that it flows better on TV. I’ve just sat through two episodes of Naruto pep-talk, and can appreciate a story getting straight to the point. Ushio & Tora does indeed get straight to the point. It tells its story concisely and efficiently, all the pieces fit together neatly like a jigsaw, and it has more than enough time to have fun developing the characters and making the story entertaining. The protagonists in Ushio & Tora rely on a lifetime of buddy-cop movies to inform their relationship. Initially antagonistic towards each other the two become reluctant partners, that over the course of the series develop a grudging mutual respect that eventually becomes a brusque affection. It’s a lively and entertaining, almost-friendship that holds the attention as the series sets its stall and develops its story. 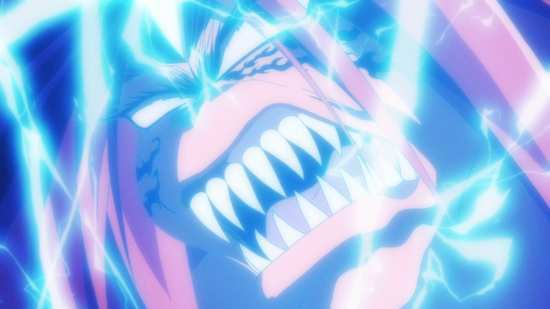 The story leads up to a major confrontation with Hakumen no Mono, who is an unseen menace in the first two-thirds of the show, and then a very visible enemy in the final third. 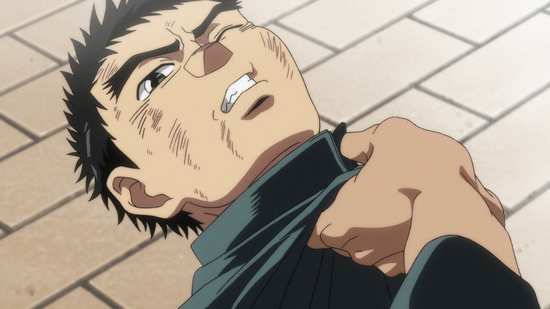 The thing is that Ushio hasn’t been paying attention to his father’s lessons about the occult, instead trying to live a normal life as a schoolboy, so when he pulls out the spear and frees Tora, it’s a rude awakening to a whole new world. The first two thirds of the story really are Ushio & Tora on a journey of discovery, with Ushio learning the true history of Japan, the history of the Beast Spear, and his own family history as well. 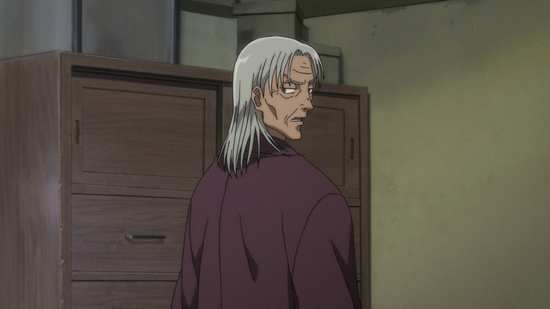 The first few episodes introduce the main characters, set up the premise, and offer the comic value of Tora trying to fit into modern society. 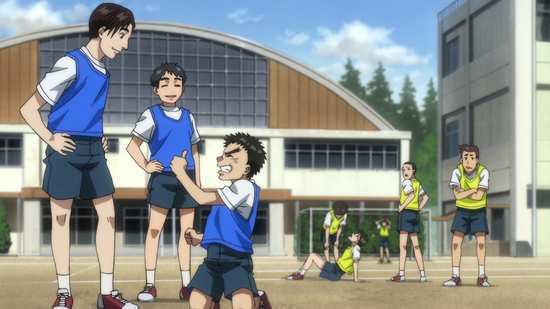 Ushio & Tora also begin their reluctant partnership when they first encounter dangerous demons, and wind up helping some of Ushio’s classmates. All this supernatural mayhem causes Ushio no little consternation, so his father tells him to take a journey to learn more about himself, and meet his mother who he was told had died not long after he was born. Their journey takes them to various places, meeting more demons, both good and bad, other humans too with supernatural connections, an exorcist, a girl with mystical powers, priests belonging to the same sect as Ushio’s father, and other people who claim to be destined to wield the Beast Spear, and all the while Ushio’s learning more about the Beast Spear, Hakumen no Mono, and the history that surrounds it all. 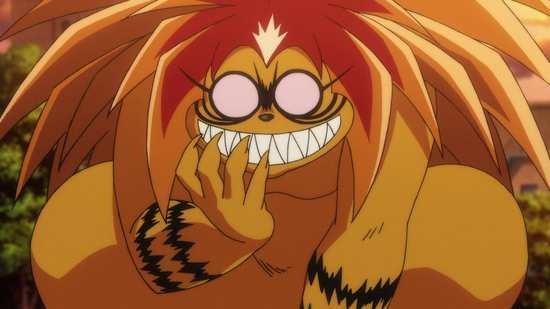 It’s best to think of Ushio & Tora as two separate series, after all, it was made that way, and it’s only this Blu-ray release that gathers all 39 episodes together. The first 26 aren’t all that edifying as an ongoing narrative. It’s quite piecemeal, Journey to the West style, with Ushio & Tora having adventures on their travels. They meet lots of people on the way, make new friends, and the odd new enemy, and they learn and grow from their experiences. But you might be forgiven for thinking that characters like Hyou, Saya, Raishin & Kagiri will all show up in their respective stories and then be forgotten thereafter. Certainly they might slip from your mind while watching the show, as there is no tendency to refer back to earlier events here (something that the long running shonen series have no problem in doing to pad out runtimes). Things begin to come together close to the end of that first 26 episode run, although the final two episodes are as random as they come. But then the second series begins, and the story changes completely. The last 13 episodes are one, full narrative, the final campaign against Hakumen no Mono, and while the show still takes time out to fill in the last few gaps of the story, it’s really a concentrated narrative heading towards the inevitable climactic battle. 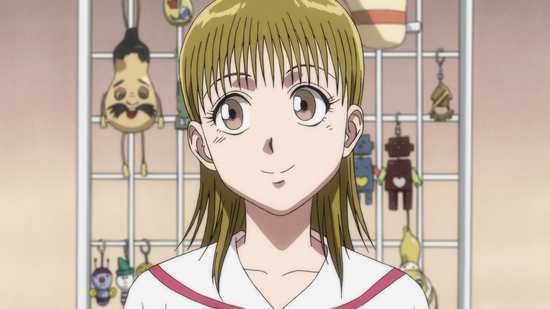 And more importantly, everything that happened in the first 26 episodes, all the characters that Ushio & Tora encountered along the way, all play a part in the conclusion of the story. So if you didn’t pay attention, you might find yourself a little lost. That is one of this show’s weaknesses, in that character arcs set up early on might require in some instances waiting 30 episodes for those arcs to be fulfilled. While the narrative may still be strong, the emotional immediacy of those storylines is lost. But the most important, most meaningful story here, that of Ushio & Tora builds strongly and consistently to its conclusion, and in that respect, this show really does fulfil expectations. There’s something to be said for stories from a different era. 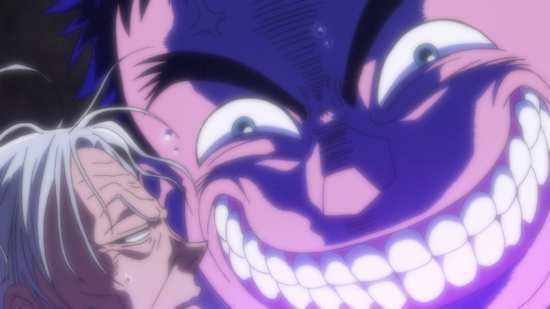 The Ushio & Tora manga might be over 20 years old now, but the anime feels fresh and vibrant. That’s probably because we haven’t seen an anime like this for 20 years, and given modern animation techniques, Ushio & Tora looks and sounds fantastic. It’s a rich and entertaining story that is efficiently told in its 39 episode run time. Were it made back in the day, it probably would have stretched to 150 or more, and would have been nowhere near as entertaining. 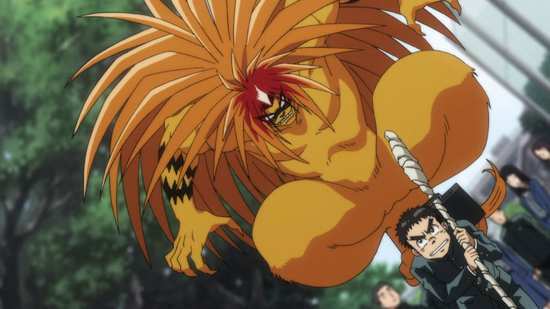 If you’re a fan of shonen anime, you really should take the time out to watch Ushio & Tora.